Oh Mai If I had an egg roll or sushi roll for every time some faux-foodie told me a restaurant was fusion cuisine – I’d have enough inventory to operate my very own *non* fusion restaurant. I’d also have plenty left over to pelt at the dilettante too. Actually that’s not a half bad idea, I might start walking around with a pocket full of egg rolls to launch unceremoniously at pompous pinheads. Let’s be clear, a fusion restaurant is not simply a place where you can find a variety of foodstuffs. Otherwise my kitchen pantry would be fusion, as would your local mall food court. 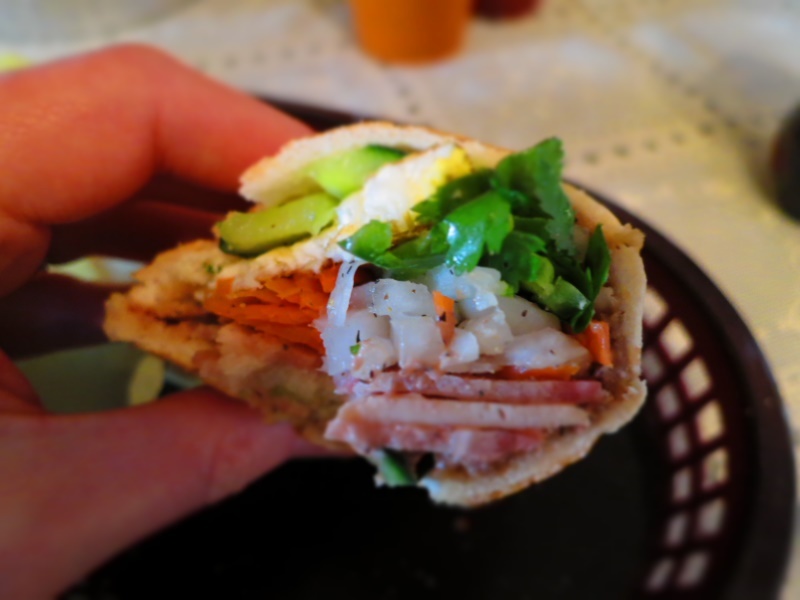 The Banh Mi sandwich is beautiful example of what fusion cuisine *is*. Two cultures meet in a bar, they hang out, have drinks, exchange phone numbers plus ingredients and technique. The result of their encounter is a dish that blends a dash of this, a chop of that, and creates something that makes you slap your forehead – perfect – why didn’t I think of that. For my money, the finest purveyors of Banh Mi in Salt Lake City are the incredibly humble folks at At Oh Mai. The first of their two locations can be found on State Street, operating from a blink and you’ll miss it building. In case you blink and miss, here’s the restaurant: (click all images for larger versions) If you’ve never heard of a Banh Mi sandwich before, don’t worry, you’ll be craving one in just a few minutes. 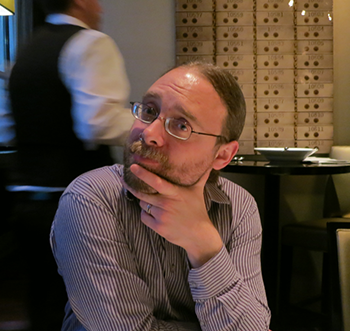 Back to that fusion thing – its a blend of both French and Vietanmese cuisine. A crusty French baguette loaded with deliciousness like pate and pickled veggies often julienned. If you stop by the State Street location of Oh Mai, the restaurant handily offers a cheat sheet as you walk in: The above creation best represent’s Oh Mai’s “S1” selection, the most authentic (and scary for most I imagine) option, cramming this list of awesomeness into a hefty baton of bread: steamed pork roll, jambon ham, pork head cheese, garlic-butter, pork pate, mayo, cucumber, cilantro, pickled carrots & daikon, salt & pepper, green onion, and jalapeño. Quite frankly its amazing. Amazingly cheap too. The price for this magical treat? $4.18. Yup, four hundred and eighteen pennies. It might just be the apex of price<>flavor in all of SLC. But wait, pork head cheese, pork roll, er, what now? Don’t worry, you can dip your toes into the world of banh mi far more accessibly than this deep end of the pool. The menu offers tend sandwiches with plenty of more accessible choices such as: Honey Glazed Pork ($4.48), Spicy Beef Short Rib ($5.28) or Yellow Curry Chicken ($4.48). You can also go large on the meat for a trifling $1.28 extra, and add a sunny side up egg for 98 cents. Seeing a theme with those prices? 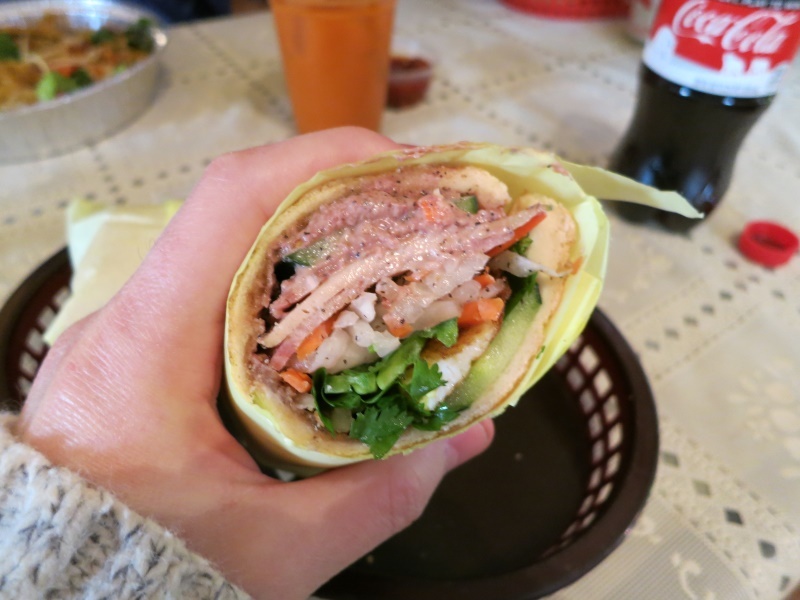 While sandwiches are the standout stars here, there are other Vietnamese dishes too. 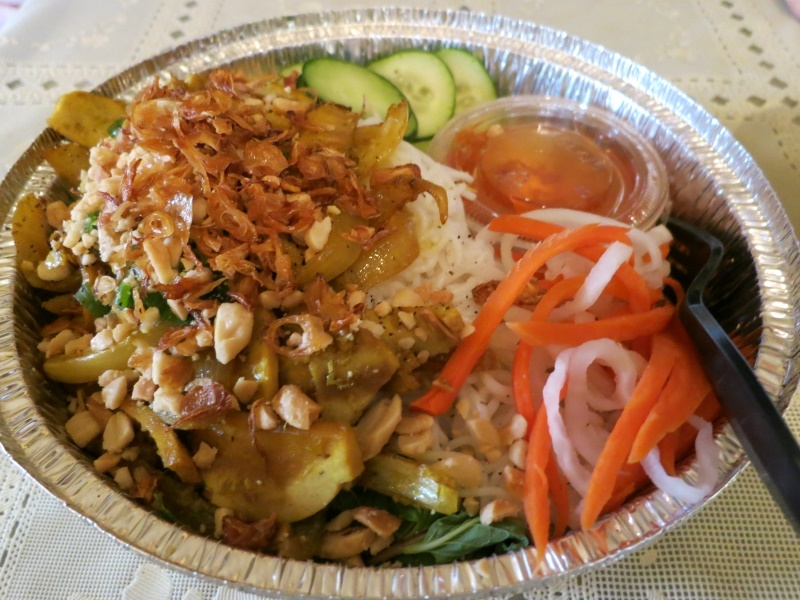 Notably, a smattering of rice dishes, salads, more than respectable pho not to mention bun – vermicelli noodle salads. Vegetarians and vegans are catered for well too, as this Vegi Bun ($6.48) attests: Parking is tight, especially at lunch, so go pre-armed with a quick inspection of Google Street Map. 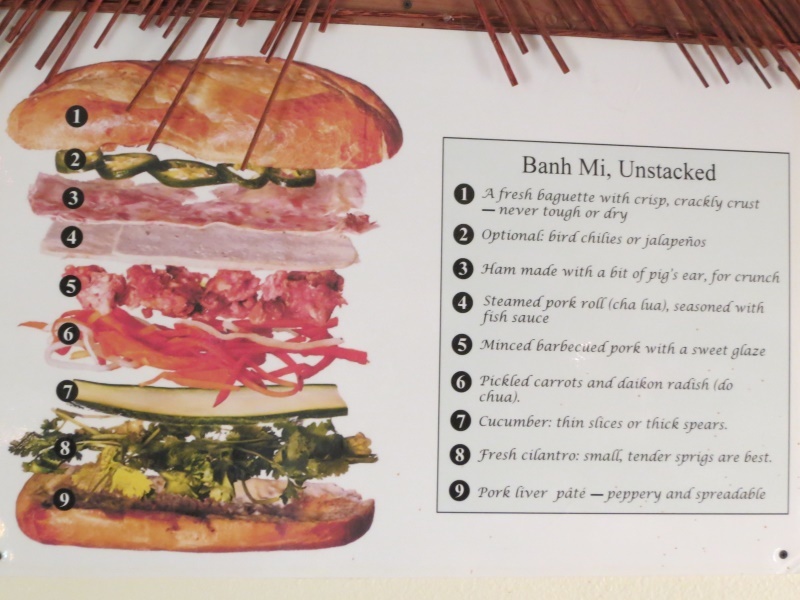 And in something of an American<>Vietnamese fusion, maybe fission would be better – there’s even a loyalty card program to rack up points for a free banh mi too! 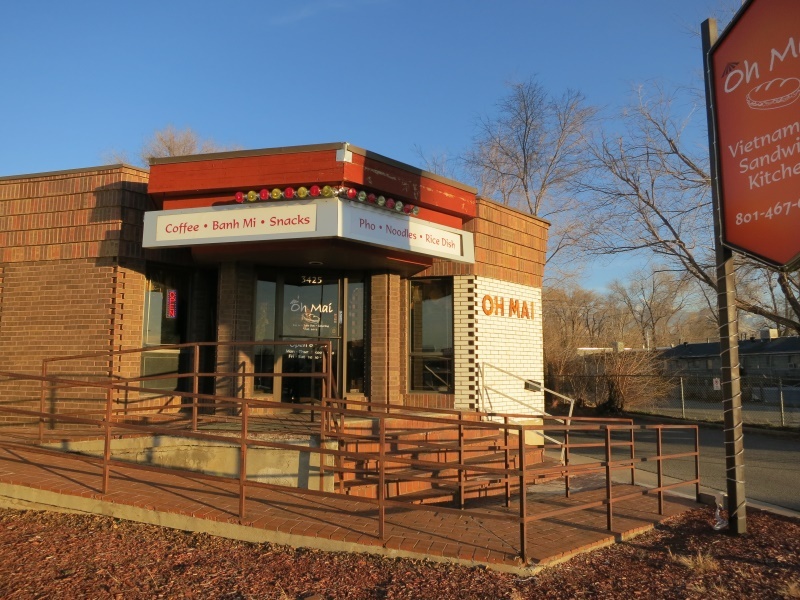 Oh Mai 3425 S State St Salt Lake City, UT 84115 (801) 467-6882 Rating: 5 out of 5. Reviewed by Stuart Melling on Oct 3rd . or 6093 S. Highland Dr. Holladay, UT 85121 801-277-9888 www.ohmaisandwich.com Indochine Way back in the mists of time (SI value: five years), I don’t recall being overly impressed when I wrote my original review of Indochine Vietnamese Bistro. The restaurant never really quite managed to grab me by the cojones, demand I hand over my money and come back time and again. However, leap forward to today and that’s exactly the painful situation I now find myself in. Maybe its me, perhaps its Indochine, or just the alignment of the stars – whatever – I’m now a huge fan of the business. Inside, not much has changed, its visually the same old Indochine, and the location in the University area remains a parking puzzle of the highest order on busy evenings. 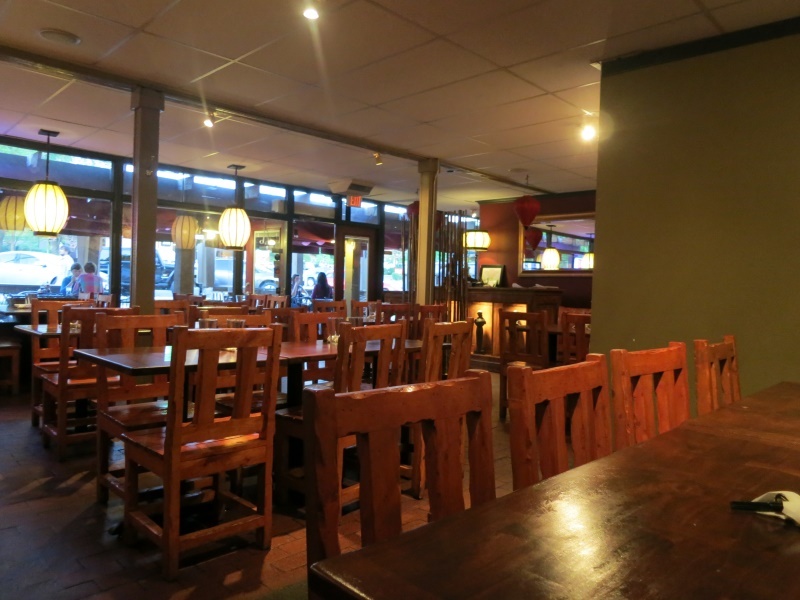 Diners looking for a cheap, hole in the wall Vietnamese, won’t find that at Indochine. 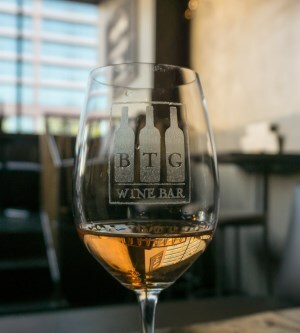 There’s a full bar with Squatter’s on tap and fancy cocktails too; for non imbibers chew and sip on boba or Vietnamese coffee with rich condensed milk. Prices are higher, reflecting the neighborhood, and some dishes are no doubt watered down for local palates. Yet, enlist the help of your friendly server and there are many gems to be found here. 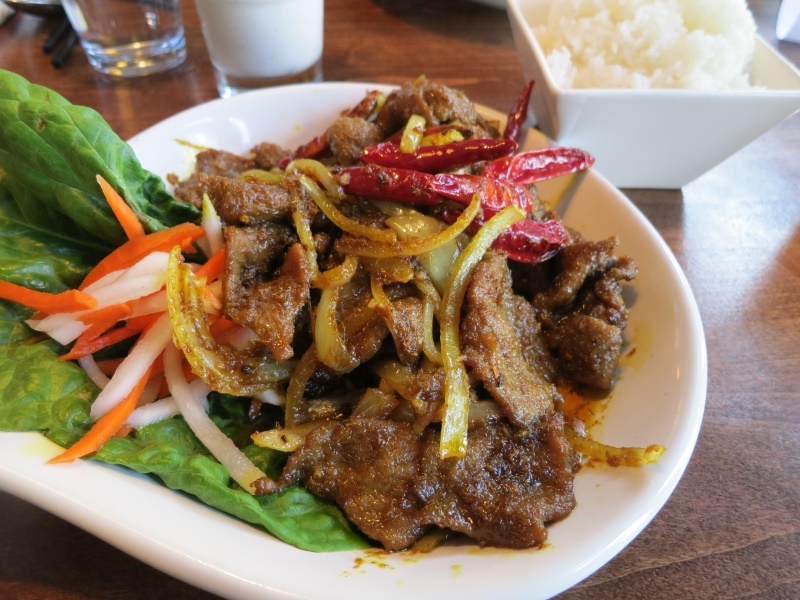 This summer I fell head over heels in love with Chili Spiced Flank steak – Bò Xào Så Ot – as impossibly difficult for me to pronounce as it is to take a mouth watering picture of a big plate of brown meat (see below). Multiply the picture’s blah-ness by 10 and you’re only slightly approaching how good this dish tastes. Thin pieces of tender flank steak are sautéed with garlic, onion, red chili, lemongrass and curry. Not overly spicy for a self confessed heat nut, but easily set aflame with one of Indochine’s carousels of hot sauce if you give the nod. 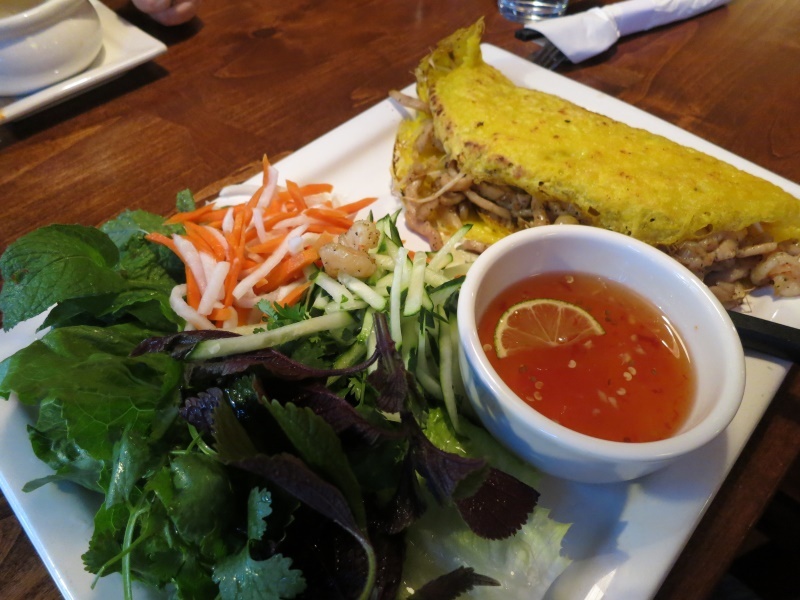 Perhaps the biggest revelation on my summer of rediscovery was Banh Xeo ($14), sizzling crepe. Rice flour, turmeric and coconut milk form the base of a crepe batter. That mix is then swirled in a a sizzling pan and filled with sautéed pork, shrimp, and onion. Bean sprouts and mung beans follow and the whole shebang is steam cooked to finish. The plate is served with herbs such as thai basil and also a lime-tomato fish sauce. If all crepes where made this stunning, I’d eat them more often (which is more than practically never): Indochine also makes a mean bun too, featuring rice vermicelli, lettuce, fresh herbs, bean sprouts, cucumbers, scallion oil, peanuts – the lot served with copious amounts of fish sauce. 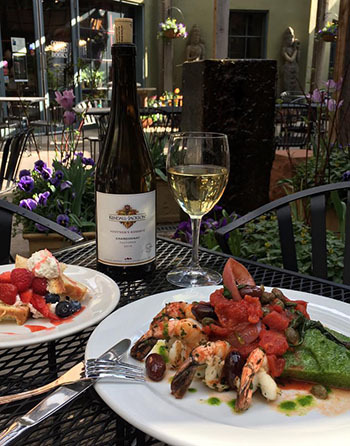 The salad can be dressed up with all manner of options (see menu here), everything from steak to meatballs to shrimp. This is the tofu version: The menu retains quite a few familiar Chinese food items, including a range of fried rice dishes – the standout for me Com Chien Toi Ga va Que ($8.50), Garlic Chicken and Basil Fried Rice. 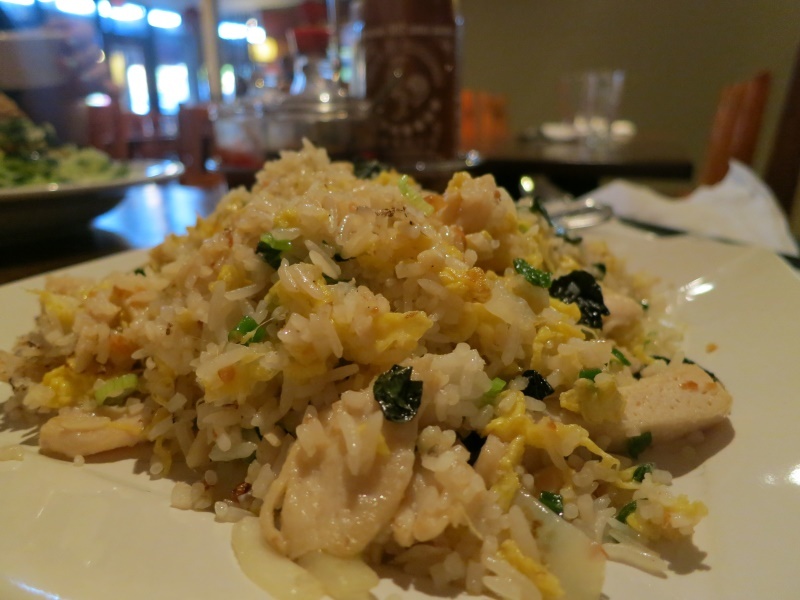 I’m a fried rice fanatic and this stuff with garlic, onions, eggs, fresh basil, chicken and fish sauce is one of my favorites in the valley: If you’ve not been in a while, I’d heartily recommend any of these dishes washed down with a pint of Full Suspension. 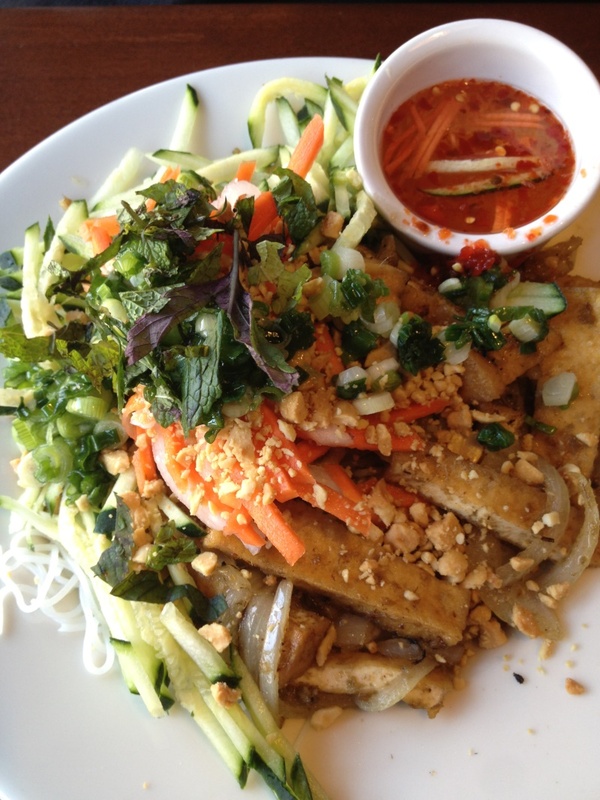 Indochine Vietnamese Bistro 230 S 1300 E Salt Lake City, UT 84102 (801) 582-0896 http://indochineslc.comm Rating: 4 out of 5.